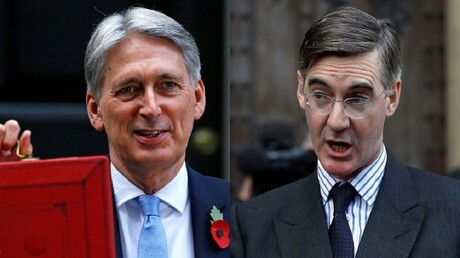 UK Chancellor of the Exchequer Philip Hammond has enraged Brexiteers by labelling Jacob Rees-Mogg and Boris Johnson, among others, as “extremists,” for their pursuit of a ‘no-deal’ Brexit. Hammond, who made the antagonistic remarks in an interview with Sky News shortly before May faced a vote of confidence in her leadership by Tory MPs, received a backlash from supporters of Rees-Mogg and his hardline Brexit faction, the European Research Group (ERG). “I think what this vote today will do is flush out the extremists who are trying to advance a particular agenda which would really not be in the interests of the British people or the British economy,” Hammond said. Mark Wallace, executive editor of Conservative Home, a Tory grassroots blog, took to social media to claim Hammond was “deeply stupid” to make such a comment, as the “extremists” would still be in the party after May’s confidence vote. Former UKIP leader Nigel Farage asked whether, in light of Hammond’s inflammatory remarks, it was time for a “fresh start” for the Conservatives. Wow – @PhilipHammondUK just called Conservative MPs who vote against May “extremists”. Appalling way to refer to his colleagues, also deeply stupid. If May survives this, those “extremists” will still be in her Parliamentary Party. So the majority of the country, including the 17.4 million that voted for Brexit, are in Hammond’s view, all extremists because they want to live in an independent democratic country? Jesus wept. It’s like he is living on a different planet. Where do they find these people? On Thursday Rees-Mogg hit back at Hammond, who voted remain in the 2016 EU referendum, dismissing his views by taking a pop at the government department he runs and ridiculing its economic forecasts. Fellow Tory ERG member, Bill Cash, MP for Stone in Staffordshire, rejected Hammond’s assertions, insisting: “We’re not extremists we’re defending British democracy,” adding his wing of the party are fighting for the people who voted for Brexit. It comes as Prime Minister Theresa May secured a less than convincing majority in a confidence vote over her leadership of the party on Wednesday. 200 MPs backed May, while 117 voted against her. Some Brexiteers have highlighted that 139 MPs were on the government payroll or aides to ministers and can be assumed to have backed her. It meant she secured only 61 votes from Tory backbenchers, Brexiteers said.